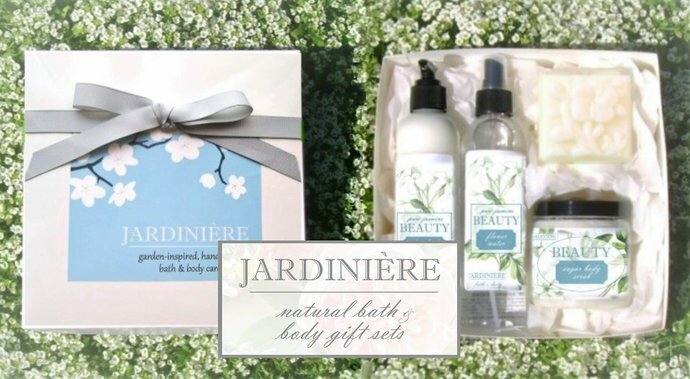 Enjoy four natural, handmade JardiniÃ¨re Bath and Body care products in a gift set for you or someone you love. 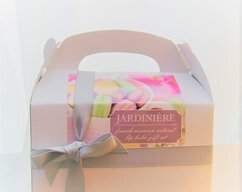 : ) This set is beautifully wrapped in a glossy white 2-piece gift box (8 x 8 x 3") with white tissue paper and luxurious fabric ribbon. See below for garden-inspired fragrance descriptions. 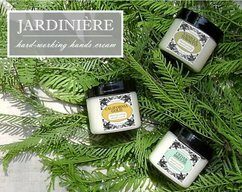 All JardiniÃ¨re products are made with custom blends of essential oils, botanical oils and phthalate-free fragrance oils. They're also paraben free, formaldehyde free, sulfate free, and perfect for senstive skin. Light and fragrant, this lotion absorbs quickly and leaves a silky, smooth feeling. 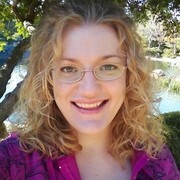 Moisturize your skin with Aloe, Vitamin E, Avocado Oil, and Kosher Vegetable Glycerin. This item is in a BPA-free 8 oz. bottle with a locking pump dispenser. Never overpowering, this spray is perfect to wear or scent the air and linens like a fresh bouquet of blooms, bunch of garden herbs, or bowl of farmer's market fruit. This item is in a BPA-free 8 oz. bottle with a fine mist sprayer and cap. This handmade soap has a creamy lather and wonderful, garden-inspired fragrance. Nourish and soften your skin with alpha-hydroxy and vitamin A-rich goat milk, coconut and palm oils, and raw grade-A California honey. 3.5 - 5 oz. beautifully molded bar in clear wrap to preserve fragrance. A head-to-toe skin care All Star--the pure cane sugar gently exfoliates and deeply nourishes skin, and the organic coconut oil cleanses, softens, moisturizes, and protects from shaving nicks and razor burn. This item is in a BPA-free 8 oz. jar with secure screw-on lid. Mild but invigorating and surprisingly sweet Grapefruit oil blends with a hint of Clary Sage oil to clear away the mental cobwebs and awaken the senses. Itâs downright joyful. Refreshing green apple extract is wrapped around fragrant honeysuckle oil to create a scent combination that smells like summer. A customer favorite at festival booths! 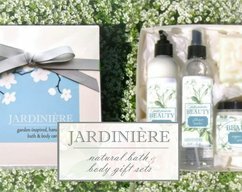 A gorgeous duo of white flowers: the soft, regal scent of Royal Jasmine (Jasminum grandiflorum) joins with the exotic depth of Arabian Jasmine (Jasminum sambac). The effect is sweetly intoxicating! The sweet scent of wild violets is an undiscovered treasure for most. The whole sensory experience is hereâwoods, water, and a natural carpet of flowers. Smell it and feel the dayâs stresses soften. When the mountain town of Idyllwild is blessed with snow and rain, a beautiful creek flows through the heart of town, and wild strawberries grow along its banks. Iâve combined their fragrance with a hint of the oak trees that provide dappled shade, and the scent of gently flowing water.